Today as many of you are reading this, we’ll be hosting Bible-quizzers from churches in Bordeaux and Romilly-sur-Seine along with their coaches and national Quiz leaders. It’ll be the first time that a quiz tournament, or any other of multi-church youth event, been held here. Dominic & Soph will be quizzing for our church. We’re excited that they and the Goliger boys (our other young family) will get to spend the day with other Christian young people from around the country. Those occasions are few & far between due to the distance and the small number of churches. One of the things I just can’t get enough of is hearing guitar around the house. At first it was only Dominic. Increasingly though, I’ll catch Sophie and sometimes Timo as well. It could be a new chord, a new strumming pattern or even a new song. So. GREAT. to hear! As much as last week had some negatives, this week we had one of the best, if not the best midweek service since our arrival last year! We’ve been working through the 5 habits of a disciple (Bible Study, Prayer, Tithing, Fellowship and Holiness) and were on lesson #4, the importance of Christian Fellowship; “not forsaking the assembling of ourselves together, as some are in the habit of doing” (Heb. 10.25). Before teaching however, the presence of God came in during worship… ministering to one of the men of our congregation in a wonderful way! Thank you Lord for your presence! One of the courses that Sophie is doing through Abeka Academy is “Family & Consumer Science”. To those of use who were in school in the 80’s & 90’s … you might recognize it more if I call it “Home Economics”. Either way… she’s learning lots about the food groups, counting calories, looking at ingredients and cooking. Last night we were treated to a marinated steak, a salad (two kinds of lettuce… fresh from the garden, fresh mandarines and carmelized cut almonds) and garlic bread. Accompanied by home-made ice-tea and vanilla pudding made from scratch for dessert. O. My. Goodness! The girl can cook too! It’s pretty much time to refresh gardens with Spring flowers so I put in some fresh primroses at the church. Part of cheering up the outside of the building as we welcome all these quizzers today. 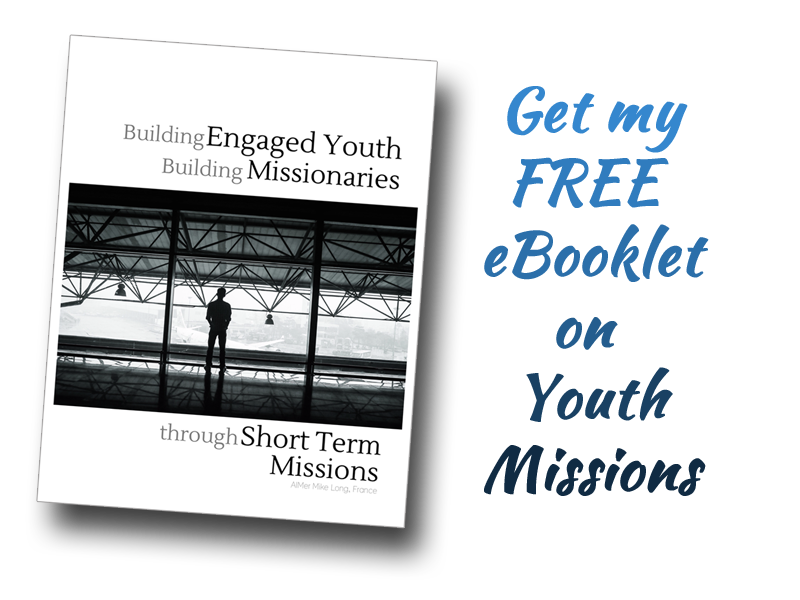 “Building Engaged Youth, Building Missionaries, via Short Term Missions”, you’ll know I’m passionate about young people being involved in missions. We can’t offer financial support to other AIMers at this point but I can give back “electronically”. Blogging helps supporters feel connected and if AIMers reflect normal population trends… many would have no trouble doing regular updates, but they don’t feel comfortable setting up a blog / website. Setup is pretty easy for me (Thanks WordPress!) so I’m offering to help newly appointed or currently serving AIMers. I’ll do a basic site & blog set-up for them for free… I want to see them succeed. Read about that here. If you’re not an AIMer but would be interested in blogging and would like help with a blog / a WordPress website setup, I’d be glad to help as a way of raising extra support dollars for our AIM term. Email me & we can discuss details. As I mentioned up top… this week saw the anniversary of our arrival in France. We’re excited to be here and highly blessed to be partnered with such fine folks as you. What a privilege it is to serve God in this part of the world.